This tool is created for the teachers or advanced Chinese learners to type Chinese on a tablet, smart phone or PC that does not have a built-in Chinese Input Method Editor(IME). It is fast and runs on all the modern web browsers. No additional software or browser plug-ins need to be installed. Press Ctrl key to toggle input cursor to the Chinese text box so you can enter numbers and letters into the Chinese text or edit the Chinese text, for example, selectively delete some Chinese text, add white spaces or line breaks. Press Alt + Shift key to show and select a Chinese punctuation mark New. When you press the backspace key and there is no more Pinyin letter in the Pinyin input box to delete, the last character in the Chinese text box will be deleted. The candidate character and word entries are from Arch Chinese Chinese-English dictionary. The Generate Vocab List button allows you to create a new vocab list from the Chinese text and save it to the cloud for future use. 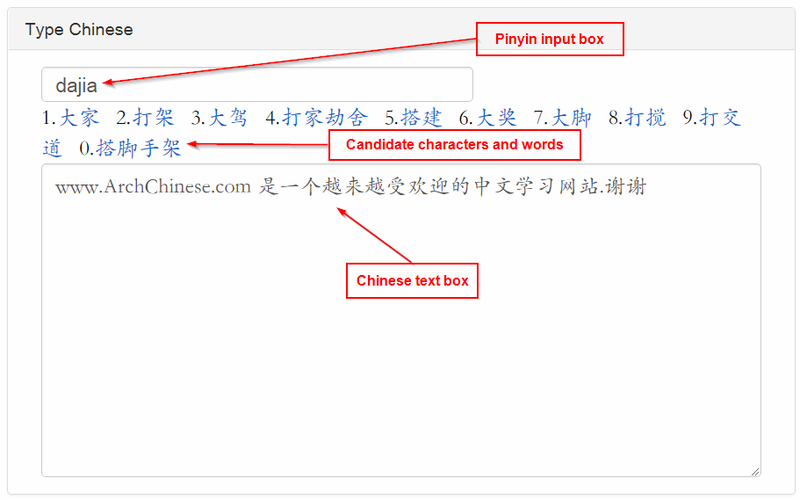 You can also click the Copy to Clipboard button to copy the Chinese text and paste it into other pages or applications.